The Big Book of Yoga arrived by FedEx today and just as I needed it. 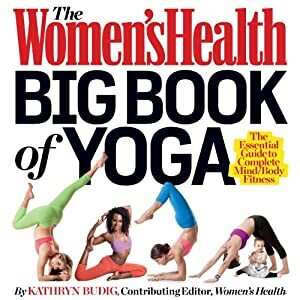 Authored by the beautiful (inside and out) Kathryn Budig, a full-time yoga instructor and very wise woman. The first chapter, Ready, Set, Om begins "If you picked up this book, you're probably one of three types of people: either you're curious about yoga, you want to deepen your practice, or you're just a sucker for pretty pictures." Rejuvenating, uninterrupted sleep with the soothing P.M Yoga workout on p. 170. Tight or sore from running or cross-training? Ease your muscles with the restorative poses on p. 155. Kathryn Budig moved to LA at 21 initially to get into acting. As a lean, fit yogi she was told to lose 10kg to get any lead actress roles or be resigned to "the best friend". Racked with self-doubt she found that where she really felt peaceful and assured she was beautiful just as she was, was when practicing yoga. Lately, I've been told I look great, which is a double-edged sword because actually I wasn't well and lost 5kg and I know I need it back on (at least) to function at my best! So, perhaps it's time we all stopped listening to other people and whether on the mat, or in a crowd, learn to be yogis from the inside-out.